Alex Contreras behind the counter of his coffee shop. 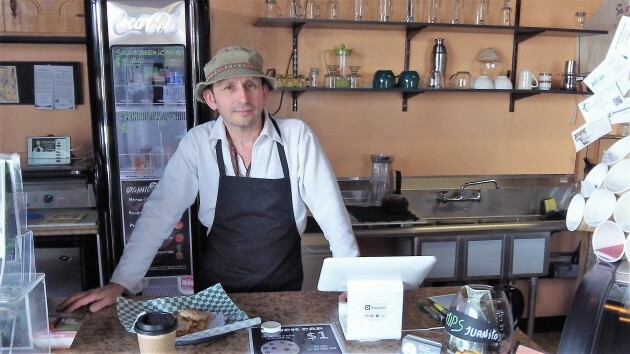 Contreras grew up in Costa Rica, worked in his father’s coffee business there, studied music and became a classical guitarist, immigrated to this country and, a year and four months ago, opened his coffee shop in the Carriage House Plaza. 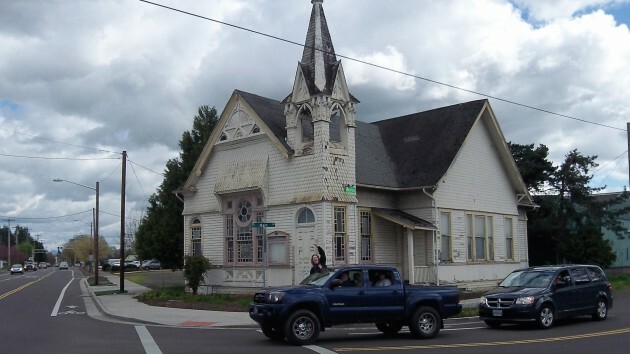 Across the parking lot, at Santiam Road and Main Street, there’s the historic Cumberland Presbyterian Church, built in 1892, vacant for many years, and bought by the city of Albany for $150,000 in 2000 because it was in the way of street expansion plans. The street plans changed and the property was declared surplus. In February 2015, the city council agreed to sell it for a token $111 to Samaritan Ministries, which wanted to restore it and use it as a counseling and support center for people in need. But that plan fell apart and the city still owns the property. It has leased it on a month-to-month basis to Contreras and his wife. They use the building for storage now. But Contreras has high hopes. He’d like to move his shop there and run it as a kind of cultural center that would combine coffee, music and visual art and serve as a gathering place where English- and Spanish-speaking Albany residents would mingle, more than they do in their daily routines. Photographing the old church seems to have prompted an enthusiastic response. Driven past this building for 40ish years, saddened by its decline. Hope its bones are worth saving because the style and glass are. Please do this!!! It sounds like such an incredible project! Such an icon in this town and it would be a shame to have to watch the deterioration for very much longer… What a beautiful dream…. Thanks Hasso. Pleased to see the positive response.. Sounds like a good project; but, is there room for a parking lot? If there isn’t enough for the “required” number of spaces would the City be willing to do some sort of conditional space permit? This building, even in its present state, is beautiful. I, for one wish Mr.Contrereas the best. It is sad to see the decline of this beautiful building while owned by the city. CARA needs to step up and make something positive happen for this historic treasure. And Alex’s idea sounds intriguing.